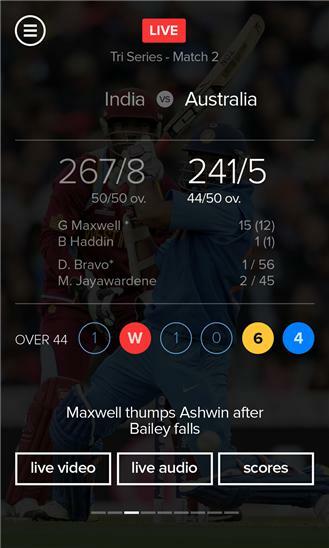 Quick Summary: - Your official Star Sports App for LIVE streaming - LIVE cricket streaming for all ODI, T20 & Test cricket matches - Live ICC Cricket World Cup 2015 streaming featuring India, Australia, England, South Africa, Sri Lanka, Pakistan and other cricket teams - Full LIVE scorecard, LIVE scores, ball by ball commentary, match schedules, points tally, standings & other statistics, fixtures & results for all sports including LIVE cricket - LIVE coverage includes Twenty20, One Day Internationals & Tests across international cricket matches, series & tournaments - LIVE match streaming, match highlights, full replays, video on demand for match clips, video highlights for batsmen & bowler innings Introducing the official starsports.com app, your LIVE TV for all sports. Download the starsports.com app for free, and enjoy LIVE action from your favourite sports. LIVE Cricket, Football, Tennis, Formula 1 (F1), Kabaddi, Badminton & Hockey streaming will keep you in action round the year. 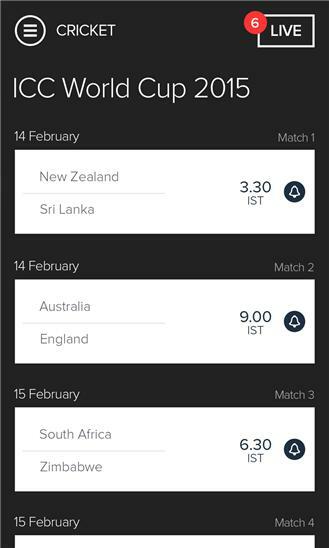 The app allows you to follow the match the way you want – LIVE and 5 min delay match streaming, scorecard, LIVE scores & commentary, video match highlights, fixtures & results, points tally and team standings. To watch the match LIVE, simply subscribe & watch LIVE matches on the advanced video player, which is packed with premium features. This app has everything you need to follow your favourite sport online: a perfect LIVE TV companion! We would love to hear from you. Please send us your suggestions and feedback to hello@starsports.com and visit us at www.starsports.com Please note: videos will only work on 3G and Wifi connectivity. What's new: We are pleased to bring in a brand new version of the starsports.com App: Watch the ICC Cricket World Cup 2015: 1. We have redesigned the home page for you. If a match is live, you catch it on the screen itself. What's new: We are pleased to bring in a brand new version of the starsports.com App: Watch the ICC Cricket World Cup 2015: 1. We have redesigned the home page for you. If a match is live, you catch it on the screen itself.